Imagine waking up in the early hours of the morning of June 4, 1896 to ungodly sputtering and clanging sounds coming in from the street. That’s what residents of Detroit, MI woke to that day. Most likely they were annoyed and certainly none realized they were witnesses to what would become one of the greatest achievements of the 20th century. 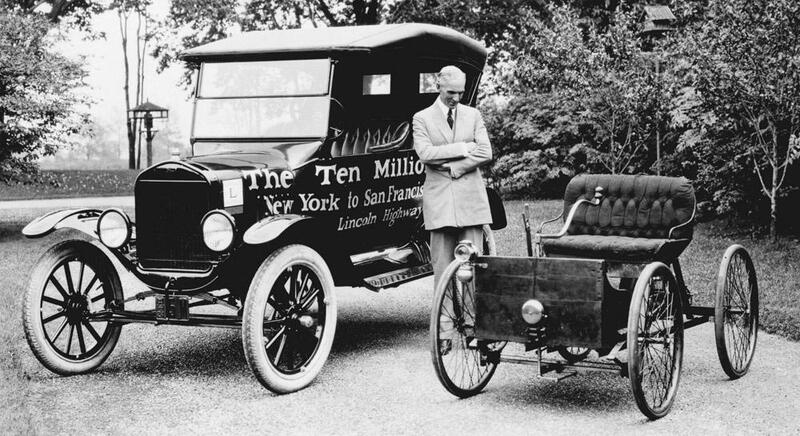 Henry Ford had just driven past them in the first automobile he’d built on its very first test drive. Ford was not the first person to build an automobile. What he did do is change the way they were built and sold and thus opened up automobile ownership to almost every American. His success with early models gave him the experience in design and manufacturing to launch the Ford Model T in 1908, the car that put American on wheels. This first Ford was named the Quadricycle, as it ran on four bicycle tires. As many struggled to build their own motorcars, Ford took the route of simplicity and made the Quadricycle as uncomplicated as possible by using commonly available materials like angle iron for the frame and the seat from a horse-drawn carriage. There was no steering wheel, just a tiller, and the transmission was a simple affair with two forward gears and no reverse, constructed of a leather belt and metal chain. The 32-year-old Ford had built the Quadricycle in a workshop behind his home. After two years of tinkering, his car ready to drive, and Ford had to remove part of a brick wall to remove the Quadricycle from its birthplace and roll it out onto the street. The inline two cylinder engine was based on a design from American Machinist magazine. The Kane-Pennington engine, as modified by Ford, displaced 59 cubic inches and developed four horsepower. Unfortunately the design was incomplete and Ford had to devise his own ignition system. At first the engine was air cooled though Ford later added water jackets to the cylinders to eliminate overheating. It was said the Ford Quadricycle could attain a breathtaking 20 miles per hour – only a train was faster at the time. Working on the Quadricycle at night, Ford was employed full-time during the day as Chief Engineer at the Edison Illuminating Company in Detroit. The Quadricycle impressed Edison who encouraged Ford to establish his own manufacturing company. 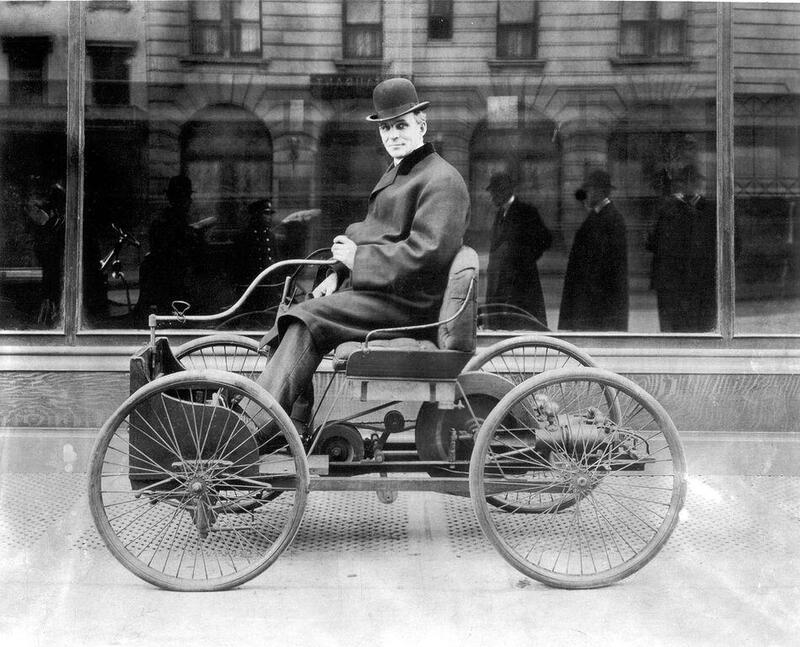 Ford sold the original Quadricycle in late 1896 for $200, which he spent on materials to build a second car. After two failed attempts, the third company Ford established in 1903 continues to this day as the Ford Motor Company. The relationship between Edison and Ford went from employer-employee to that of fellow inventors and industrialists, often camping together along with tire magnate Harvey Firestone. In its first year, the Ford Motor Company turned a profit of $37,000 with a shareholder investment of just $28,000 (about one million dollars of profit against an investment of about $700,000, adjusted for inflation). An astute businessman, Ford bought the Quadricycle back in 1904 for $65. Today the first Ford car is proudly on display at the Henry Ford Museum in Dearborn, Michigan. Stop by your local Southern California Ford Dealer and see what we’ve learned in building quality, reliable cars, trucks, and SUVs over the past 122 years.